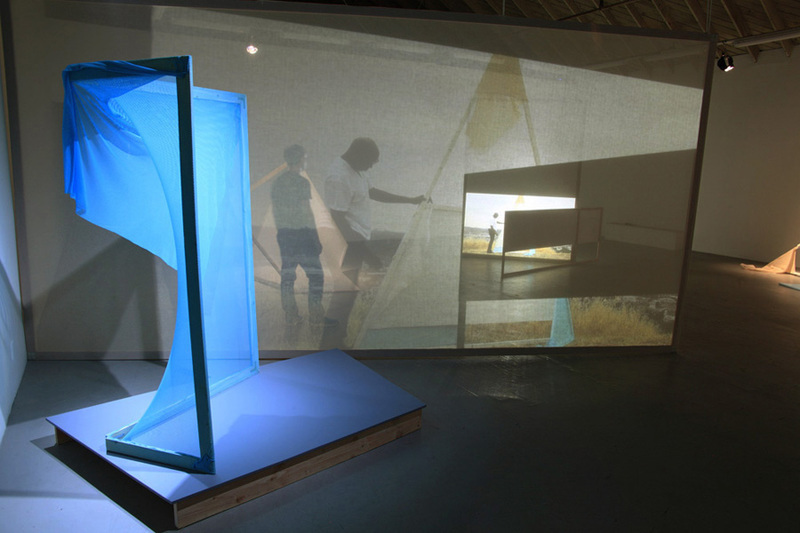 Inside Las Cienegas Projects in LA, an hour loop of video seems to move around the gallery. The video shows various actors manipulating sculptures, some of which (or close cousins of which) are gracefully spot lit and catching bits of the action. Playing on objects’ surfaces, histories of the objects or histories of similar objects. A dancer teaches a phrase, the student has to pull his recalcitrant leg to get in the teacher’s position. Confidently nudged through the space by sculptures and a single projection projecting onto and through staggered screens and sculptures as screens, I am part of the action, I am moving through, making shadows. This sculpture is sized one size bigger than me, precisely big enough for me to get around it and situate it, imminently variable. This sculpture is shimmering, skeletal, engineered, unfolding geometry, bright white and scintillating. This sculpture is made of wood—soft, fine, no more than needed. Stapled to this wood, fabric—taut, slim screen or pert tent with extra angles that can find a way comfortably to resting at bending. Where there are crucial points, fistful-swathes of fabric can hang loose. This sculpture is bright mesh blue, vibrating. David teaches me how he wants me to stand and point. He has shot video of a team setting up a concert in the rain. (I have set up concerts in the rain. I think I know concerts in the rain.) I point like the boss in the poncho, like David points in Sandy’s living room to the image of the stairs coming off a truck. In the alley out back behind Sandy’s garage, I stand, I lean back a little on my heels. I am authoritative, strict with my index finger, David at his camera. David and Sandy offer me various frames, hinged and hinge-tied, strange objects slightly awkward at first, the weight of which I understand relatively quickly and then can fast spin around. I take these objects and push them to their limits, raise them high. I want to determine their ends. Break joints? If necessary. This is about direction. This is about precision, choosing one possibility. This is about practice. Determine the limits of an object or event. Determine the limits more precisely. Repeat, until further precision is impossible. Balance. I take one frame, learn to balance it on my palm, push it up as high as it can go before it falls over. David records. In the video, we see Brooklyn... Sandy—bundled—quietly battles a cold pier wind, transporting a frame past a wind-whipped family, the daughter looses an apple; the apple rolls past Sandy. The framing is tight around the figures; the edits are crisp. A flaking alley wall, street shoes, and a dry Los Angeles hill look lush. The pace of the video is semi-hypnotic, though the actors move with intention, the motion feels like an old sailor new to demonstrating how to raise sails, consciously slowing time to do something carefully that she has done many too many times without thinking. We measure actions, act with objects outdoors—under the bridge, against the wall, cool, perhaps on a back-up ship, safely behind the blockade. Back in the camp too, we are training. This video is hinged to this sculpture is hinged to this video and this video hinged to this sculpture, two solid temporalities, flexible each, thigh to knee, knee to thigh, two leg machines. Try to re-create in your mind, if you will, ballet performances at a Jean Tinguely and Nicholas Schoffer exhibition of kinetic art, Le Musee des Arts Decoratifs, Paris, 1963: Ballet dancers leap while raising and fluttering their forearms, crossing their arms at their elbows next to Tinguely and Schoffer whirring tower constructions of gears. Similarly, the twin motors in David Kelley and Sandy de Lissovoy’s kinetic undertaking, you could have one without the other—a separate screening, a strong sculpture show, and we will have more from each of these artists individually in the future to be sure, but the hinging of forms here is pleasurable, like seeing machine juxtaposed with individualistic movement, like hands in gloves. Reference: Two Kinetic Sculptors: Nicholas Schoffer and Jean Tinguely, edited by Sam Hunter, New York: October House, 1966; and The Quick and The Dead, edited by Peter Eleey, Minneapolis: Walker Art Center, 2009. Photographs courtesy of Sandy de Lissovoy and David Kelley.